Fizzy Science! Saturday, May 19, 2:00 pm, Civic Center Library TechKnowKids will help us explore chemical reactions in a fun, hands-on class! Register online or call 586.751.0770. Ages 6 to 10. 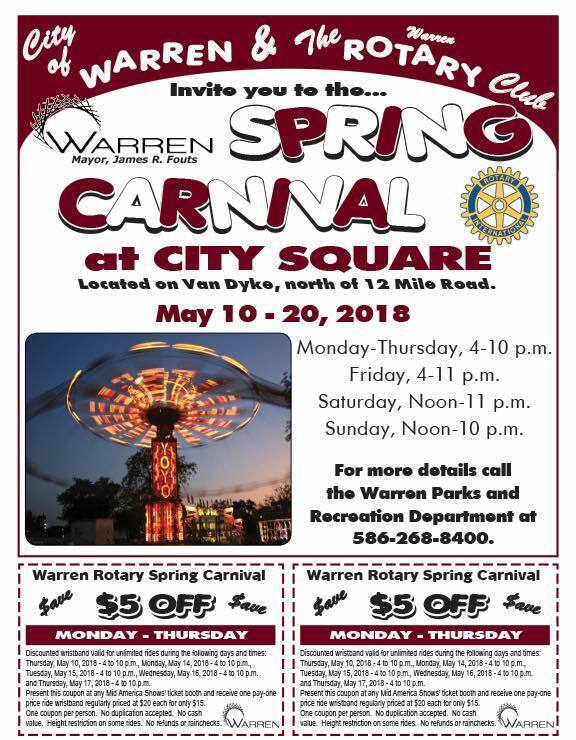 Spring Carnival, now thru May 20 at City Square. Comedy Chop Shop May 27 at 7:00 PM – 10:00 PM An Open Mic Comedy show at Hot Rock Sports Bar & Music Cafe. Warren’s Greatest Garage Sale is Sunday, May 27 and Monday, May 28 from 10 a.m. – 5 p.m. at the Warren City Square Parking Garage on Van Dyke, north of 12 Mile Road.